Planning to set up another new factory, Jing Duann, combined with its outstanding forging technology and experienced turnkey services, will launch a publicity campaign for this expansion in Beijing Machine Tools Expo. this August. Excellent as a forging press manufacturer, Jing Duann Machinery Industrial Co., Ltd. convinces markets for more than three decades of its high-speed machines, high-precision testing equipments, and perfect production line management by its own core competence—Customer Oriented by Experienced Turnkey Service. With its precise view of future target, Jing Duann never stops improving its manufacture like forging machine, forging press, forming machine, roll forging machine, cold/hot forging press, knuckle joint cold forging presses etc., and launching full automatic technology to satisfy global demands. No doubt, impressed by its exceptional forging technology and well-equipped factory, Jing Duann, which works with ranges of component suppliers/manufacturers such as motor forged parts, forged gears and hand tools, plans to play a bigger role in 2008. A big breakthrough came in this year—Jing Duann's new cooperation with Japanese local motor manufacturer, Honda, came at the right time. Jing Duann has completed a new project with Japanese motor manufacturer by its special service early in this year. Standardization of motor components in Japan is definitely strict, and less foreign manufacturers can occupy an important position in Japanese market easily like this. However, Jing Duann made this happen. 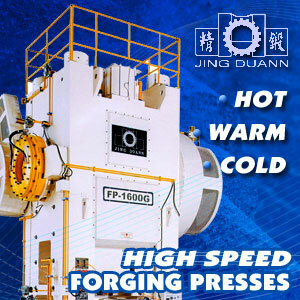 Jing Duann's FP Series High Speed Forging Press and JKP Knuckle Joint Cold Forging Press, of which output is 10000pcs/8hrs, offers its client a big eye by producing the stable and high-quality forgings. Combined with its turnkey project, Jing Duann innovates the machines that are designed to provide Honda a special specification: 30pcs/min to raise its client's production rate. Additionally, Jing Duann has given assistance to its client for setting up a new plant with full automation. What's more about the new progress? From this July on, Jing Duann will keep this project in R&D Lab Pilot Run Phase, testing more molds/machines for its client. As a leading forging tech-integrator, Jing Duann also takes effort on turnkey solution service for worldwide manufacturers, especially for beginners in forging business. It can not only offer clients advices & know-how of setting up a new plant, but can assign some senior solution counselors to give clients assistance. An Indian forging press manufacturer, to which Jing Duann will assign its senior sales & counselors in this September, is a coming example for this typical project. To widen its marketing channels, Jing Duann offers sorts of thoughtful services, including component/equipment purchasing service for clients. 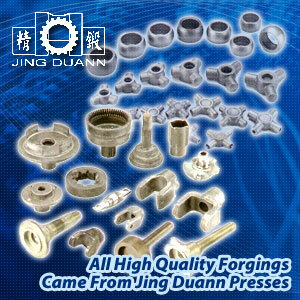 Clients all over the world can contact Jing Duann for this service while in need with mass procurement. For instance, early in this year, Jing Duann assisted a motor manufacturer in Brazil to purchase band saw with mass quantity, helping its clients to cost down. Lowering waste, launching full automatic technology, and elevating its production capability are three main codes of Jing Duann's core enterprise. According to these principles, it expects to expand a new factory to upgrade its efficiency by re-planning the production lines, and upscale its capability from 400~1600 tons to 800~3200 tons with more machines. Looking forward to setting up more partnership, Jing Duann will definitely show global markets its strength by this expansion. High-tech and high-efficiency machines of Jing Duann Machinery Industrial Co., Ltd. includes the following products like forging press manufacturer, forging machines, hot & cold forging machines, roll forging machines, forming machines, forging presses, knuckle joint cold forging presses, etc. You can see more products or services in Jing Duann website, and gain more information by contacting us.